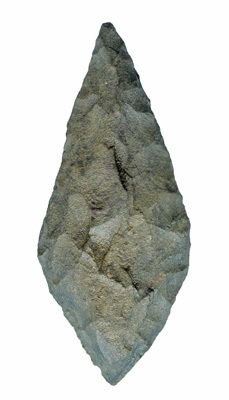 General Description: The Rossville is a medium sized, thick, roughly knapped, lozenge-shaped point with a contracting stem. The blade edges are usually straight to convex with the shoulders being the widest part of the blade. The shoulders are either rounded or pointed but not barbed with a few specimens having definite right angle shoulders. The stem contracts to a rounded or pointed base and can have a concave edge outline. Overall, the point is diamond shaped and can be asymmetrical. The size range for the Rossville point is in the 32 mm through 64 mm range with typical average length being between 44 mm and 51 mm. The average maximum thickness is 8 mm. The Rossville was usually made from siltstone , argillite, quartz, felsite , flint, argillaceous shale and chert . The Rossville point type was named by Alanson Skinner for specimens that he found at the Rossville site on Staten Island, New York. Notes: The Rossville is very similar in shape to the Piscataway Type and the two types may overlap in southeastern Pennsylvania. The Rossville is the major type of the Bushkill Complex , associated with the Lagoon point type. 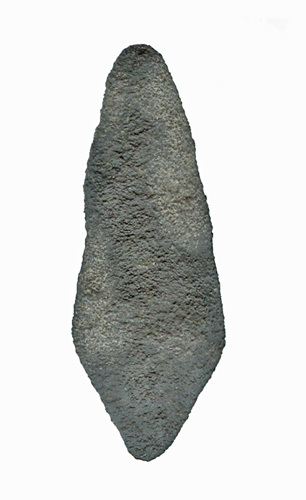 Has been referred to as the "Type K Contracting Stem Point" and as the "Lozenge Shaped Point". More than one-third of known points are made from siltstone.